Use durable, stainless steel s-hooks, bacon hangers, boning hooks and stockinette hooks to hang a wide variety of meats, including ham, sausages, bacon and more! 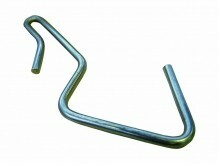 Stainless steel “S” Hooks available in a wide variety of sizes, from 4mm to 12mm, with swivel hooks also available. 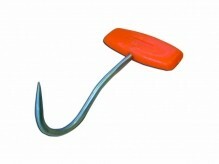 S hooks can be used to hang a variety of different products and materials, from meats to pots to plants. Attach to wire shelving to optimize and efficiently use storage space, and can be used in grocery stores to hang dial scales. Meat hooks are used in butcheries, grocery store delis, and meat packaging operation to properly dry and hang a variety of meat products. 5” and 6” stainless steel boning hooks available with a polypropylene handle, which provides users with a secure and relaxed grip. Use a boning hook to safely and effortlessly handle large pieces of meat. 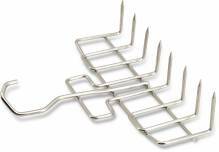 Stainless steel hooks used in food establishments such as butcher shops, restaurant, grocery stores, and by hunters, fisherman, and more!